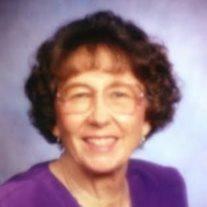 Yvonne May Graves Pollock, age 86, of Mesa, Arizona passed away peacefully in her home surrounded by her family on Wednesday morning, January 1, 2014. She was born on April 19, 1927 in Grand Rapids, Michigan. She moved to Monterey, California in 1950, where she met her husband Richard Edwin Pollock at a USO dance at Fort Ord Army Base. They were married two months later at the Carmel California Mission in 1952. She was a loving mother to her five children. She was creative, fun loving, and very active in her children’s lives. Her family is her biggest treasure. She became a member of the Church of Jesus Christ of Latter-day Saints in 1968 at the age of 41. In 1970, she was sealed to her husband and children in the Los Angeles Temple. Her devotion and enduring faith to the church has been an inspiration to her children and grandchildren. Her youngest daughter, Mary Ann was born with Down syndrome which led her to become a strong advocate and caregiver to those with special needs. She became a foster mother for countless severely handicapped children over a span of 19 years before she suffered a stroke requiring her to move to Mesa, Arizona to be near her family. Preceded in death by her parents Irving and May Graves and brother Irving Graves, she is survived by brothers: Maynard (Judy), Tom (Hedy) and Rick (Sally) Graves; her five children: Colleen (Jeff) Lewis, Karen (Rudy) Komenda, Richard (Leslie) Pollock, Annette (Bill) Castrey and Mary Ann Pollock; her 20 grandchildren and 25 great grandchildren. She has been our matriarch and pioneer, leaving us a legacy of faith and service. On Monday, January 6, 2014 from 6:00-8:00 p.m., a viewing will be held at Bunker’s Garden Chapel, 33 North Centennial Way, Mesa, Arizona. Services will be held on Tuesday, January 7, 2014 at 11:00 a.m. at 2424 North Old Gilbert Road, Mesa, Arizona. She will be laid to rest in the City of Mesa Cemetery, 1212 North Center Street, Mesa, Arizona.